Our list of ethical advertisers has been growing throughout 2017. This year has seen the Body Shop, Thread, ETA Insurance, JOY and many others give positive public commitments about their advertising. 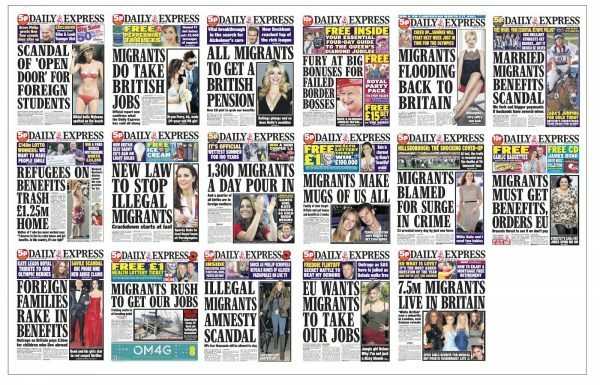 But with Christmas fast approaching, many Stop Funding Hate supporters have been asking for more information about those companies – especially retailers – who continue to align themselves with the Daily Mail, Sun, and Daily Express. So we’ve asked Ethical Consumer to help us put together a league table, giving estimates of the top advertisers in each of these papers, in the run up to Christmas and throughout the Christmas season. Today we are publishing the first phase of this research over a four week period (9th October to 6th November). The top three Daily Mail advertisers, based on estimates by Ethical Consumer, were Sky, Wilko, and the furniture company DFS. The top supermarket was Lidl (in fourth place overall). Marks & Spencer, Tesco and Iceland also all featured. The top three Sun advertisers estimated by Ethical Consumer were Sky, BT and Virgin Media. The top supermarket based on this research was Morrisons, with Asda also featuring. Note: Both Sky and Talk Sport Radio are owned by the same company as the Sun. If we exclude those from the estimated top 10 then the 9th and 10th slots would be occupied by Tesco and Lidl. The top three Daily Express advertisers estimated by Ethical Consumer were the Health Lottery (owned by the same company as the Express), Liverpool Victoria insurance, and Admiral Insurance. The top supermarket was Morrisons, with the Co-op also featuring. If we exclude the Health Lottery, then based on these estimates, Iceland would be in 10th place. November and December are crucial months for supermarkets and other retailers, with a large proportion of their yearly sales happening during Christmas shopping season. So if you are concerned about a company’s financial support for the Daily Mail, Sun and Daily Express, this is a great time to let them know. We’ll be publishing a further update soon listing the full estimated top 30 Mail, Sun and Express advertisers based on this phase of research. We’ll also be continuing this research throughout the Christmas period. In the next few weeks we will reveal an updated league table based on advertisers during November and December. If you’d like to support further research, you can make a donation here. It’s impossible to know the exact amount that each company spends on advertising in the Mail, Sun and Express as many do deals and get discounts. But, using publicly available rate cards, we can see the relative price of each kind of advert. This means that as well as tracking which companies advertise the most often, we can see whether they’re buying the most expensive kinds of ads, e.g. full page colour spreads. The more research we do, the better we’ll get at tracking and categorising the information.